The idea of doing a fully balanced workout in the fresh air on a circuit that takes about 30 to 45 minutes to complete sounds almost too good to be true. Outdoorsy simplicity is back and there is a renewed appreciation for the good old-fashioned workout the parcourse offers. Thanks to Peter Stocker, our Mountain Lake Park Parcouse is a San Francisco gem. The beauty of the circuit is that you can tailor your workout to your needs and pace, and there is generally no wait to use the equipment and best of all, you are outside and it is free! Peter Stocker (1942-1990), golf icon and Bay Area real estate developer (Pacific Union), installed the first U.S. parcourse in Mountain Lake Park, San Francisco in 1973. Please check the Parcourse details and images at the end of this post. And for more information, please read on! It is a fitness trail; from medieval Latin (percursus), it literally means running through. A Swiss architect, Erwin Weckemann, invented the first parcourse in Zurich in 1968. Parcourses soon dotted the European landscape by the hundreds; a fitness trend was born. 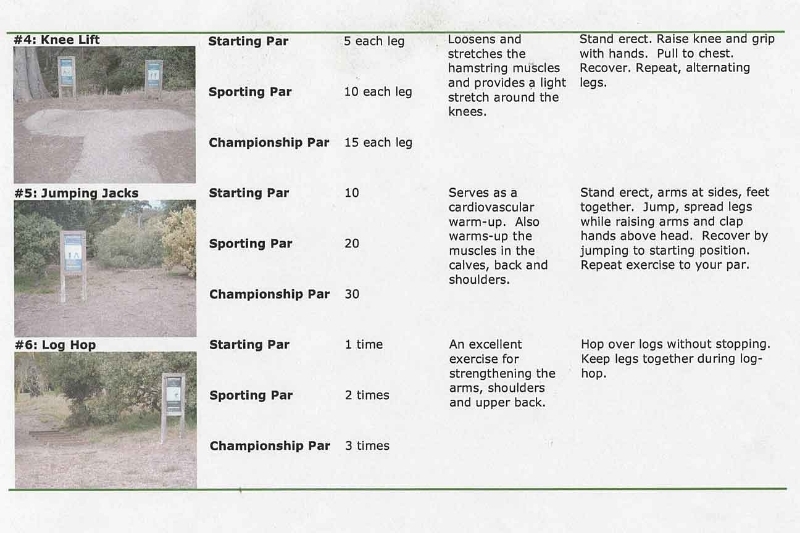 These fitness trails gathered momentum through the nature-loving 70s and into the early 80s, with thousands popping up throughout the U.S. Then came the gym craze, with glamorous bells and whistles and a league of helpful staff and personal trainers, and parcourses seemed unsophisticated in comparison. 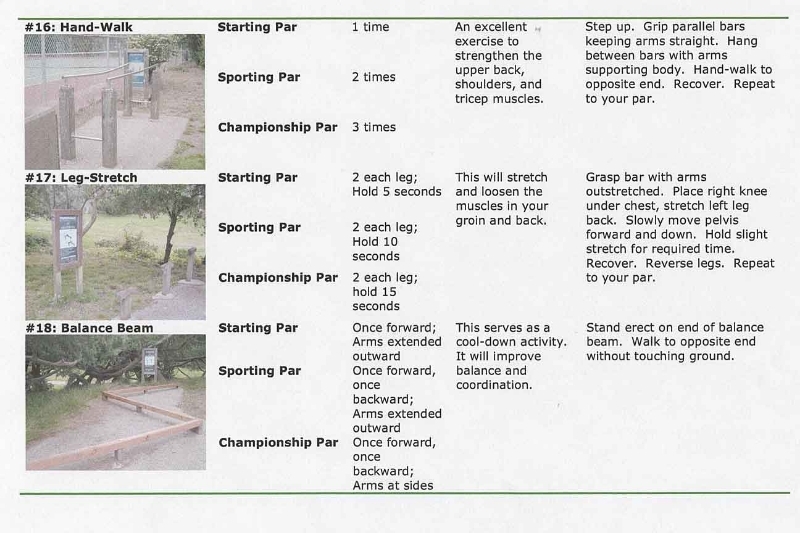 The parcourse features a number of stations (typically 18-20) set along a jogging path with basic equipment, instructions and illustrations to guide exercisers through a solid, full-body workout. 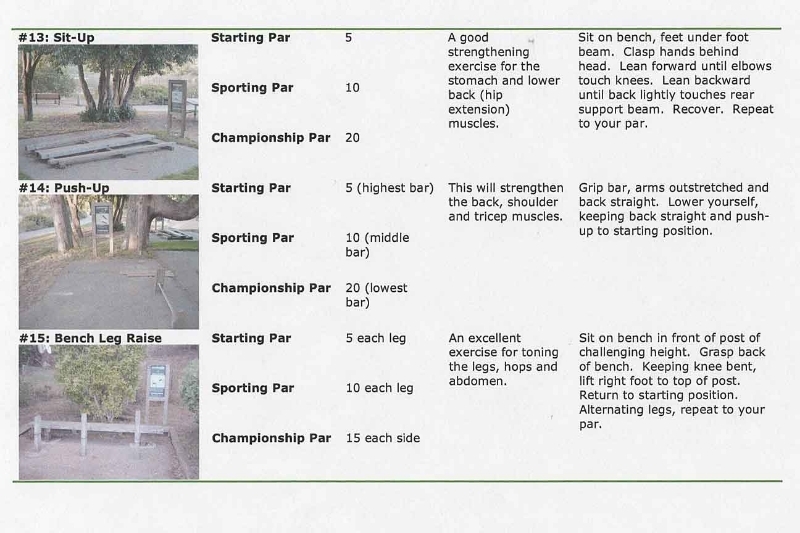 Parcourse consists of a series of fitness stations (where you perform specific exercises) which are spaced along a jogging and walking path in this area, as you can see from the Parcourse map. Simply follow the WALK or JOG direction signs to each fitness station until you reach the FINISH sign at the end of the Parcourse. 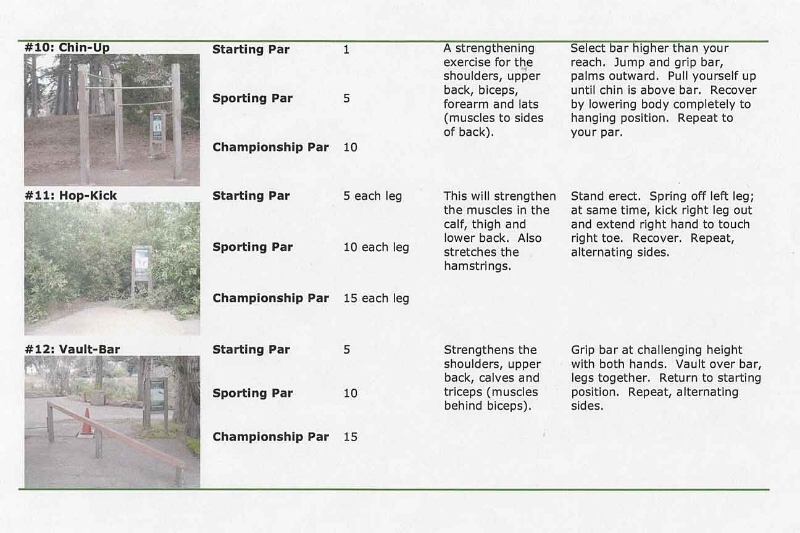 As the name Parcourse implies there is a recommended Par or number of repetitions suggested on each sign for each of three different fitness levels. 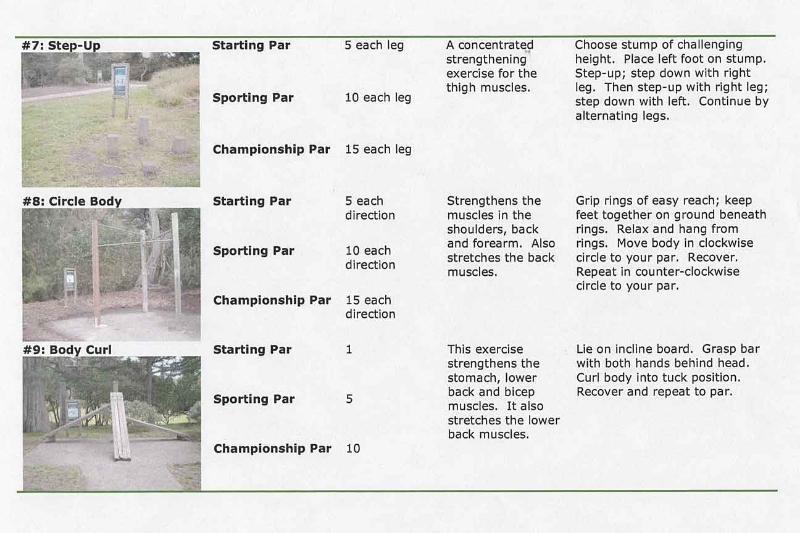 As you select your fitness level: Starting Par, Sporting Par, or Championship Par. 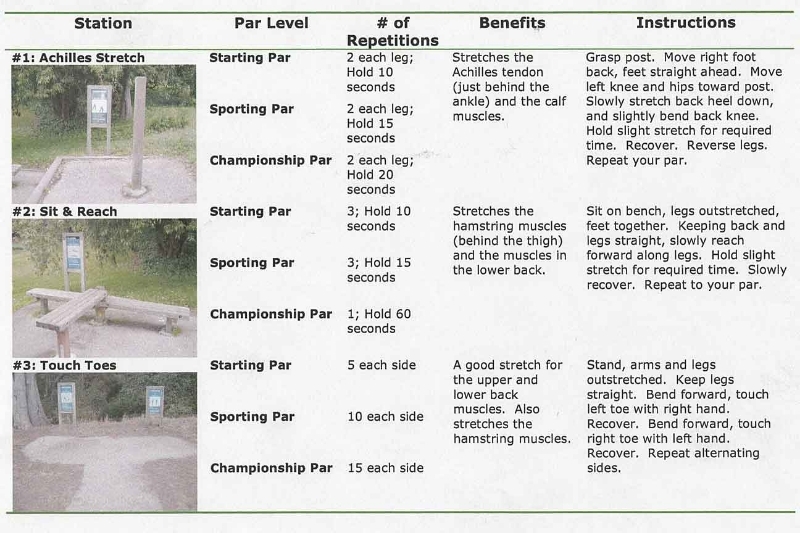 Remember that the Par merely represents recommended goals, based on you own physical condition.